BILLINGS, Mont. (AP) - Dozens more wild bison were herded into corrals on the border of Yellowstone National Park to await possible slaughter Thursday, as a much-heralded initiative to expand where the animals can roam in Montana collapsed. An estimated 368 bison have been captured over the last week while attempting to migrate to lower elevations in Montana in search of food. 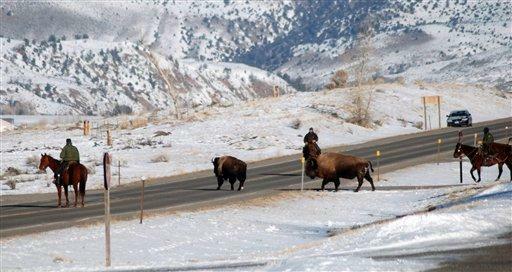 Yellowstone workers and state livestock agents are trying to halt the animals' exodus from the snow-packed park under a controversial program meant to guard against the spread of the disease brucellosis to livestock. Disease testing on the animals began Wednesday. Those that test positive for exposure to brucellosis are slated to be shipped to slaughter. Livestock officials said Thursday that those shipments had been delayed until at least Monday because of difficulties lining up trucks to move the bison. Wildlife advocates scrambled to stop the slaughter, asking a federal judge in Helena for a restraining order that would halt the impending shipments. Those involved in the legal effort said the chance of livestock being infected by bison is too low to justify the death of the iconic animals - the largest land animals in North America. "It doesn't make sense why they have such a lethal approach," said Tom Woodbury with the Western Watersheds Project, one of the plaintiffs in the case. "There are no cattle on public lands (adjacent to the park) this time of year. This seems to be more about population control than disease control." Meanwhile, a $3.3 million initiative to expand where bison can roam outside the park was down to a single animal Thursday. It has been just two weeks since 25 of the burly animals were herded onto the Gallatin National Forest, where bison had been prohibited for decades. But some of them left the 2,500-acre patch where they were supposed to spend the winter. One was shot after entering private property, and 23 were captured and shipped back to the park or returned there on their own. Park spokesman Al Nash said Thursday it was uncertain when or how the attempt to carve out new habitat for bison would be revived. Roughly half of the Yellowstone's estimated 3,900 bison have been exposed to brucellosis, which can cause infected animals to prematurely abort their young. But there have been no recorded cattle-to-bison brucellosis transmissions, and few cattle remain in the immediate vicinity of the park. Wildlife advocates said those conditions should allow government agencies to ease their restrictions on where bison can move. A spokesman for the Montana Stockgrowers Association said the livestock group is tracking the wildlife advocates' lawsuit and remains wary of any move to expand where bison can roam outside Yellowstone. Jay Bodner, the association's director of natural resources, said cattle producers whose animals are infected with brucellosis can face economic losses if buyers are not willing to pay as much for their animals. "Management actions still need to be taken," he said in reference to the government-sponsored capture and slaughter program. Park spokesman Nash said that so far, 161 of the captured bison have been tested for brucellosis. Fifty-three tested positive for exposure and 108 tested negative. But there is no guarantee the negative animals will be released. Holding them until spring in the corrals along the park border could prove impossible if more bison keep coming out of the park. The corrals only hold about 400 animals and more bison were moving toward the park border Thursday. "Bison can move a long distance in a short period and we've often seen movement in the night hours," Nash said. "Our plan at the moment is to continue testing and sorting these animals. We'll see what next week brings." In 2008, a record 1,600 bison were killed leaving the park, including more than 1,400 that were shipped to slaughter.